I can count on my hand the number of things I would rather not do over moving. Physically, moving takes a huge toll and emotionally it's straining, not to mention the cost. The best possible outcome is that the house sells quickly but that's not always a garuntee. 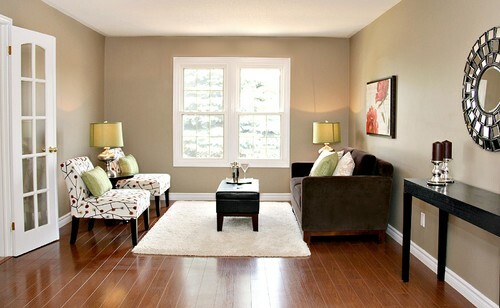 Here are a few things to do when staging your living room that will increase the sales price! Get your mind into seller mode. This place is no longer your home, it is a house and a product that you are trying to sell. Keep all of the things you love about it and all of the memories and lock them up in your heart, then put the rest in a storage unit. The people looking to buy aren't trying to buy your home they are trying to buy their new home! So separate yourself from the memories you created there and focus on making a transaction. Declutter and depersonalize. All of your stuff is great. I'm not saying you have to chuck it but let's be real some of it, if not half of it can go. 50% of all purchases in America are impulse buys, which means you did not plan on owning half of your stuff. You can't possibly be using half of it. So why not use moving as an opportunity to give yourself a little freedom from stuff. A great book on the subject is "It's All Too Much" by Peter Walsh. The book walks you through room by room on how to declutter and organize. There is a catharsis in purging that I think you'll find refreshing in anticipation of moving. Start a good six months ahead of time though because it's not an easy thing to let go of certain items. And don't think that you can just stuff everything in closets or the garage. Those spaces need to be staged too. If your stuff is that precious to you rent a small self storage unit. If you don't go looking for any of those things in six months then it's time to get rid of it. Don't pack that stuff with you when you move. Rearrange Your Furniture. In larger spaces it helps to move the furniture away from the walls. Direct the seating toward each other to promote conversation. Overly large couches and sectionals should be replaced with smaller ones. Oversized flat screens should be moved to the family room or mounted. Older style tube televisions should be donated to goodwill. 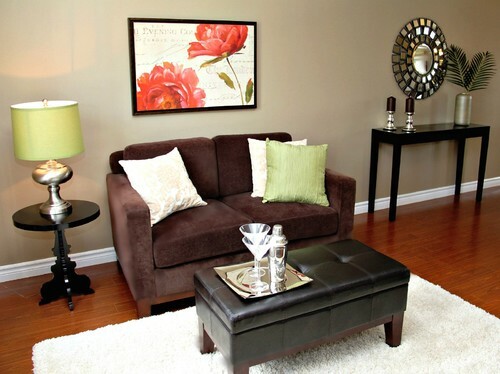 The ideal furniture setting is one couch, two chairs, a cocoa table and two end tables on either side of the couch. We want this space to feel very minimal and look like it's taken out of a pottery barn magazine. Any loud upholstery or unique pieces isn't really suitable for staging unless it's smaller like an accent chair. Remember, this is no longer your home. It is a product you are trying to sell to the general public. Painting. I promise you this isn't a plug for painting it's genuine, proven advice, with the highest return on investment of anything you can do to your home. The paint color in homes tends to be the most personal reflection of the individual than anything else. Because of this, it has to fit a particular mold. Nuetral is the name of that mold. For your walls, in the now, choose a light warm gray in a matte finish. It's very on trend and sleek but it's also general enough that it'll appeal to a wide audience. Certain shades of white are also suitable as long as it's not off the shelf white or classic off white. If your wall color is currently beige and in good shape you can leave it but I would avoid turning it beige as your neutral because it's a little off trend. I might suggest an almond if you have nice wood trim which would work better than a grey or a white. However, if your trim is wood, unless it's of a really high quality, or a hundred years old from the original house and still in perfect shape, paint it white. At some point in time a few realtors were told that keeping would trim maintains a hire value than white trim. That spread around and we get this misinformation about wood trim. The reality is, when people move in and come to me for painting, they ask if they are allowed to paint the trim white. This is because their relator told them that if they painted the cheap blondish wood from the 80's it would decrease the value of their home. This is simply not true. In fact, all you are doing by keeping your trim wood is creating a project for the next home owner. The more projects you leave for the buyer, the closer and closer your home inches toward becoming a fixer upper. Fixed uppers don't get bought for what they are worth. So paint the trim in white semi-gloss. Ceilings should be painted if they look yellow, are the same color as the wall or any other color than flat white. If you have any water marks or cracks you have to paint it, no ifs ands or buts. Even if the leak was fixed if the ceiling has that brownish stain buyers will walk in and think "oh great, the roof is going to need replaced" and they'll walk right out the door. Lastly, if you have any wallpaper in the house, take it down. Don't argue with me on this one. Take it down. You have to understand the buyer mentality. The average buyer does not want a project. Moving and getting their home ready to sell was already more project than they wanted. If you look at something in your home and think I don't want to deal with that, neither do your buyers. They will walk in, say "I don't want to deal with that" and then walk out and keep looking. Don't think that you can just give them a credit for the work upon the sale of the house. It's a bad deal for you. Interior painting has a return of investment of 72%. If you paint your living room and spend $800 to do it you'll make that money back and an additional $576 on top of it. If you give them a credit to do the painting you've just given away $800 at minimum. Decor. The decor also needs to be paired down and depersonalized. All of the family pictures and kids art, and anything that is loud or decidedly you needs to find a temporary home. You also don't want to over do it. Typically one piece of decor on a regular wall will suffice and no more than three smaller pieces on larger walls. Clocks are good, mirrors are good and abstract or impressionist prints found at Hobby Loby or Big Lots will work. Have a few silk plants around the room and a fresh bouquet of flowers on the cocoa table when showing. Books are also a good decor item for shelves but only hard back classics. Your Dan Brown paper backs will have to be temporarily shelved somewhere else. Coasters and decor magazines for the tables, throw pillows and blankets with a pop of color for the seating and adequate lamp lighting for the room. See our previous post about living in your living room for more about lighting. In conclusion, the sale of your home is emotional. These five suggestions are giving you more work and making you spend more money than you planned. I know. But the goal is to get the home sold and to build wealth in the process. Many consider a home to be an asset. I don't know that I agree with this. If you owe money on it, it's really a liability. If you don't get enough money of the sale to increase your nest egg or to fund the renovations of your next home then what kind of an asset was it really? Have you ever watched Love it or List it on HGTV? Over look the drama that they always put in there of unexpected things coming up. That's just a formula all of those shows use to create a little bit of conflict in the store telling. In the end, when they decide to list it, what happens? The value of their home goes up. Staging isn't necessarily going as far as a whole renovation. But it is making simple cosmetic changes that will greatly improve your ability to sell the house. Think of it like grocery shopping. Why is Wholefoods more expensive than Aldi? Wholefoods "stages" their produce while Aldi puts it in a cardboard box. It's all organic but it's just not the same. You can make the difference in getting your home sold by putting a little effort into it and by planning ahead of time. If you do decide to paint make sure you call early. Every year we get five or more homeowners calling us about painting before a move and they need to get us in there by the end of the week. For most of us paint companies setting up the estimate within a week can be tough. Especially around the busy season. If you're thinking about selling get your estimate now. Don't delay. It'll be too late if you wait. Even if you're still deciding, get the estimate now and schedule for later. Otherwise you'll be in a position where you won't be able to find any paint company and you'll end up taking a price cut on your home. You can do this! Thanks for reading and if you found this helpful and would like to get more advice on getting your house ready to sell or for tips to love your home more, sign up for our newsletter! Sign up with your email address to receive home tips and updates!